From left to right: Chad Hurley, Steve Chen, and Jawed Karim. YouTube was founded by Chad Hurley, Steve Chen, and Jawed Karim, when they worked for PayPal. Prior to working for PayPal, Hurley studied design at the Indiana University of Pennsylvania; Chen and Karim studied computer science together at the University of Illinois at Urbana–Champaign. 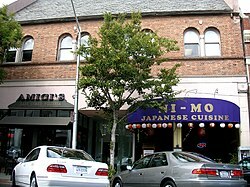 YouTube's initial headquarters was above a pizzeria and Japanese restaurant in San Mateo, California. Approximate representation of the site as it appeared a few months after its launch (archived by the Wayback Machine). The domain name "YouTube.com" was activated on February 14, 2005 with video upload options being integrated on April 23, 2005. The first YouTube video, titled Me at the zoo, was uploaded on April 23, 2005, and shows co-founder Jawed Karim at the San Diego Zoo. YouTube began as an angel-funded enterprise working from a makeshift office in a garage. In November 2005, venture firm Sequoia Capital invested an initial $3.5 million, and Roelof Botha (a partner of the firm and former CFO of PayPal) joined the YouTube board of directors. In April 2006, Sequoia and Artis Capital Management invested an additional $8 million in the company, which had experienced significant growth in its first few months. During the summer of 2006, YouTube was one of the fastest growing sites on the World Wide Web, hosting more than 65,000 new video uploads. The site delivered an average of 100 million video views per day in July. It was ranked the fifth-most-popular website on Alexa, far out-pacing even MySpace's rate of growth. The website averaged nearly 20 million visitors per month according to Nielsen/NetRatings, with around 44% female and 56% male visitors. The 12- to 17-year-old age group was dominant. YouTube's pre-eminence in the online market was substantial. According to the website Hitwise.com, YouTube commanded up to 64% of the UK online video market. On October 9, 2006, it was announced that the company would be purchased by Google for US$1.65 billion in stock, which was completed on November 13. At that time it was Google's second-largest acquisition. The agreement between Google and YouTube came after YouTube presented three agreements with media companies in an attempt to avoid copyright-infringement lawsuits. YouTube planned to continue operating independently, with its co-founders and 68 employees working within Google. Google's February 7, 2007 SEC filing revealed the breakdown of profits for YouTube's investors after the sale to Google. In 2010, Chad Hurley's profit was more than $395 million while Steve Chen's profit was more than $326 million. In 2006, Time Magazine featured a YouTube screen with a large mirror as its annual 'Person of the Year'. It cited user-created media such as that posted on YouTube and featured the site's originators along with several content creators. The Wall Street Journal and The New York Times also reviewed posted content on YouTube in 2006, with particular regard to its effects on corporate communications and recruitment. PC World Magazine named YouTube the ninth of its Top 10 Best Products of 2006. In 2007, both Sports Illustrated and Dime Magazine featured positive reviews of a basketball highlight video titled, The Ultimate Pistol Pete Maravich MIX. It is estimated that in 2007, YouTube consumed as much bandwidth as the entire Internet in 2000. Originating in 2007, the YouTube Awards are annual awards given out in recognition of the best YouTube videos of the preceding year as voted by the YouTube community. On July 23, 2007 and November 28, 2007, CNN and YouTube produced televised presidential debates in which Democratic and Republican US presidential hopefuls fielded questions submitted through YouTube. In November 2008, YouTube reached an agreement with MGM, Lions Gate Entertainment, and CBS, allowing the companies to post full-length films and television episodes on the site, accompanied by advertisements in a section for US viewers called "Shows". The move was intended to create competition with websites such as Hulu, which features material from NBC, Fox, and Disney. YouTube was awarded a 2008 Peabody Award and cited as being "a 'Speakers' Corner' that both embodies and promotes democracy". In early 2009, YouTube registered the domain www.youtube-nocookie.com for videos embedded on United States federal government websites. In November of the same year, YouTube launched a version of "Shows" available to UK viewers, offering around 4,000 full-length shows from more than 60 partners. Entertainment Weekly placed YouTube on its end-of-the-decade "best-of" list In December 2009, describing it as: "Providing a safe home for piano-playing cats, celeb goof-ups, and overzealous lip-synchers since 2005." In January 2010, YouTube introduced an online film rentals service which is currently available only to users in the US, Canada and the UK. The service offers over 6,000 films. In March 2010 YouTube began free streaming of certain content, including 60 cricket matches of the Indian Premier League. According to YouTube, this was the first worldwide free online broadcast of a major sporting event. On March 31, 2010, YouTube launched a new design with the aim of simplifying the interface and increasing the time users spend on the site. Google product manager Shiva Rajaraman commented: "We really felt like we needed to step back and remove the clutter." In May 2010, it was reported that YouTube was serving more than two billion videos a day, which was "nearly double the prime-time audience of all three major US television networks combined". In May 2011, YouTube reported on the company blog that the site was receiving more than three billion views per day. In January 2012, YouTube stated that the figure had increased to four billion videos streamed per day. According to May 2010 data published by market research company comScore, YouTube was the dominant provider of online video in the United States, with a market share of roughly 43 percent and more than 14 billion videos viewed during May. In October 2010, Hurley announced that he would be stepping down as the chief executive officer of YouTube to take an advisory role, with Salar Kamangar taking over as the head of the company. James Zern, a YouTube software engineer, revealed in April 2011 that 30 percent of videos accounted for 99 percent of views on the site. During November 2011, the Google+ social networking site was integrated directly with YouTube and the Chrome web browser, allowing YouTube videos to be viewed from within the Google+ interface. In December 2011, YouTube launched a new version of the site interface, with the video channels displayed in a central column on the home page, similar to the news feeds of social networking sites. At the same time, a new version of the YouTube logo was introduced with a darker shade of red, which was the first change in design since October 2006. In 2012, YouTube said that roughly 60 hours of new videos are uploaded to the site every minute, and that around three-quarters of the material comes from outside the U.S. The site has eight hundred million unique users a month. Starting from 2010 and continuing to the present, Alexa ranked YouTube as the third most visited website on the Internet after Google and Facebook. In late 2011 and early 2012, YouTube launched over 100 "premium" or "original" channels. It was reported the initiative cost $100 million. Two years later, in November 2013, it was documented that the landing page of the original channels became a 404 error page. Despite this, original channels such as SourceFed and Crash Course were able to become successful. An algorithm change was made in 2012 that replaced the view-based system for a watch time-based one that is credited for causing a surge in the popularity of gaming channels. In October 2012, for the first-time ever, YouTube offered a live stream of the U.S. presidential debate and partnered with ABC News to do so. On October 25, 2012 (2012-10-25), The YouTube slogan (Broadcast Yourself) was taken down due to the live stream of the U.S. presidential debate. YouTube relaunched its design and layout on December 4, 2012 to be very similar to the mobile and tablet app version of the site. On December 21, 2012, Gangnam Style became the first YouTube video to surpass one billion views. 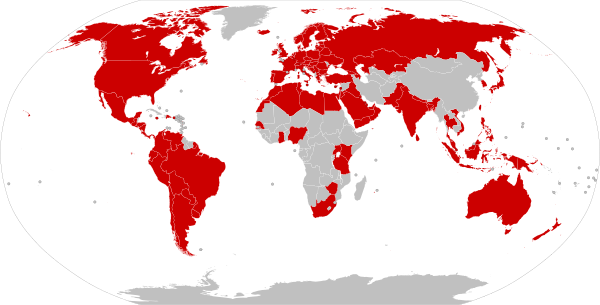 In March 2013, the number of unique users visiting YouTube every month reached 1 billion. In the same year, YouTube continued to reach out to mainstream media, launching YouTube Comedy Week and the YouTube Music Awards. Both events were met with negative to mixed reception. In November 2013, YouTube's own YouTube channel had surpassed Felix Kjellberg's PewDiePie channel to become the most subscribed channel on the website. This was due to auto-suggesting new users to subscribe to the channel upon registration. On April 3, 2018, a shooting took place at YouTube headquarters. On June 19, 2007, Google CEO Eric Schmidt was in Paris to launch the new localization system. The interface of the website is available with localized versions in 89 countries, one territory (Hong Kong) and a worldwide version. Puerto Rico Spanish, and English August 23, 2014 Use Spain version or USA version before launch. Libya Arabic February 1, 2015 Blocked in 2010, but unblocked in 2011. Google aims to compete with local video-sharing websites like Dailymotion in France. It also made an agreement with local television stations like M6 and France Télévisions to legally broadcast video content. On October 17, 2007, it was announced that a Hong Kong version had been launched. YouTube's Steve Chen said its next target will be Taiwan. YouTube was blocked from Mainland China from October 18 due to the censorship of the Taiwanese flag. URLs to YouTube were redirected to China's own search engine, Baidu. It was subsequently unblocked on October 31. Before being purchased by Google, YouTube declared that its business model was advertisement-based, making 15 million dollars per month. Google did not provide detailed figures for YouTube's running costs, and YouTube's revenues in 2007 were noted as "not material" in a regulatory filing. In June 2008, a Forbes magazine article projected the 2008 revenue at $200 million, noting progress in advertising sales. Some industry commentators have speculated that YouTube's running costs (specifically the network bandwidth required) might be as high as 5 to 6 million dollars per month, thereby fuelling criticisms that the company, like many Internet startups, did not have a viably implemented business model. Advertisements were launched on the site beginning in March 2006. In April, YouTube started using Google AdSense. YouTube subsequently stopped using AdSense but has resumed in local regions. Advertising is YouTube's central mechanism for gaining revenue. This issue has also been taken up in scientific analysis. Don Tapscott and Anthony D. Williams argue in their book Wikinomics that YouTube is an example for an economy that is based on mass collaboration and makes use of the Internet. Tapscott and Williams argue that it is important for new media companies to find ways to make a profit with the help of peer-produced content. The new Internet economy, (that they term Wikinomics) would be based on the principles of "openness, peering, sharing, and acting globally". Companies could make use of these principles in order to gain profit with the help of Web 2.0 applications: "Companies can design and assemble products with their customers, and in some cases customers can do the majority of the value creation". :289sq Tapscott and Williams argue that the outcome will be an economic democracy. There are other views in the debate that agree with Tapscott and Williams that it is increasingly based on harnessing open source/content, networking, sharing, and peering, but they argue that the result is not an economic democracy, but a subtle form and deepening of exploitation, in which labour costs are reduced by Internet-based global outsourcing. 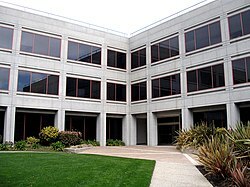 In June 2009, BusinessWeek reported that, according to San Francisco-based IT consulting company RampRate, YouTube was far closer to profitability than previous reports, including the April 2009, projection by investment bank Credit Suisse estimating YouTube would lose as much as $470 million in 2009. RampRate's report pegged that number at no more than $174 million. ^ Hopkins, Jim (August 21, 2003). "Surprise! There is a third YouTube co-founder". USA Today. Retrieved November 29, 2008. ^ "YouTube.com WHOIS, DNS, & Domain Info - DomainTools". WHOIS. 2016. Retrieved January 23, 2016. ^ Graham, Jefferson (November 21, 2005). "Video websites pop up, invite postings". USA Today. Retrieved July 28, 2006. ^ Wooster, Patricia (2014). YouTube founders Steve Chen, Chad Hurley, and Jawed Karim. ISBN 1467724823. Retrieved 21 November 2016. ^ Sara Kehaulani Goo (October 7, 2006). "Ready for Its Close-Up". Washington Post. Retrieved November 29, 2008. ^ "YouTube on May 7, 2005". Wayback Machine. May 7, 2005. Archived from the original on May 7, 2005. Retrieved December 31, 2015. ^ Alleyne, Richard (July 31, 2008). "YouTube: Overnight success has sparked a backlash". The Daily Telegraph. London. Retrieved January 17, 2009. ^ Jawed Karim and Yakov Lapitsky (April 23, 2005). "Me at the Zoo" (Video). YouTube. Retrieved August 3, 2009. ^ Woolley, Scott (March 3, 2006). "Raw and Random". Forbes. Forbes. Retrieved July 28, 2006. ^ "Sequoia's Investment Memo on YouTube". Thornbury Bristol. June 11, 2016. Archived from the original on November 22, 2016. Retrieved November 21, 2016. ^ "YouTube is the Fastest Growing Website", Gavin O'malley, Advertising Age, July 21, 2006. ^ a b "YouTube serves up 100 million videos a day online". USA Today. Reuters. July 16, 2006. Retrieved November 29, 2008. ^ "Info for YouTube.com". Alexa.com. Amazon.com. July 26, 2006. Retrieved July 26, 2006. ^ "YouTube U.S. Web Traffic Grows 17 Percent Week Over Week, According to Nielsen//Netratings" (Press Release). Netratings, Inc. Nielsen Media Research. July 21, 2006. Retrieved September 12, 2006. ^ James Massola (October 17, 2006). "Google pays the price to capture online video zeitgeist". Eureka Street. 16 (15). Jesuit Communications Australia. Retrieved October 18, 2006. ^ "Online Video: The Market Is Hot, but Business Models Are Fuzzy". Retrieved August 25, 2017. ^ "Google closes $A2b YouTube deal". The Age. Melbourne. Reuters. November 14, 2006. Retrieved March 3, 2007. ^ La Monica, Paul R. (October 9, 2006). "Google to buy YouTube for $1.65 billion". CNNMoney. CNN. Retrieved October 9, 2006. ^ Schonfeld, Erick. "Chad Hurley's Take From The Sale Of YouTube: $334 Million". TechCrunch. Retrieved August 25, 2017. ^ Stafford, Alan (May 31, 2006). "The 100 Best Products of 2006". PC World. Retrieved March 3, 2007. ^ "GooTube: Google buys YouTube". Boing Boing. October 9, 2006. Archived from the original on March 19, 2007. Retrieved March 4, 2007. ^ Carter, Lewis (April 7, 2008). "Web could collapse as video demand soars". The Daily Telegraph. London. Retrieved April 21, 2008. ^ Coyle, Jake (March 20, 2007). "YouTube announces awards to recognize best user-created videos of the year". USA Today. Associated Press. Retrieved March 17, 2008. ^ Gough, Paul (July 25, 2007). "CNN's YouTube debate draws impressive ratings". Reuters. p. 1. Retrieved August 3, 2007. ^ "Part I: CNN/YouTube Republican presidential debate transcript - CNN.com". CNN. November 28, 2007. Retrieved April 30, 2010. ^ Brad Stone and Brooks Barnes (November 10, 2008). "MGM to Post Full Films on YouTube". The New York Times. Retrieved November 29, 2008. ^ Staci D. Kramer (April 30, 2009). "It's Official: Disney Joins News Corp., NBCU In Hulu; Deal Includes Some Cable Nets". paidContent. Retrieved April 30, 2009. ^ "Complete List of 2008 Peabody Award Winners". Peabody Awards, University of Georgia. April 1, 2009. Archived from the original on May 1, 2011. Retrieved April 1, 2009. ^ Ho, Rodney (April 2, 2009). "Peabody honors CNN, TMC". The Atlanta Journal-Constitution. Retrieved April 14, 2009. ^ Chris Soghoian (March 2, 2009). "Is the White House changing its YouTube tune?". CNET. Retrieved August 25, 2017. ^ Allen, Kati (November 19, 2009). "YouTube launches UK TV section with more than 60 partners". The Guardian. London. Retrieved December 13, 2009. ^ "100 greatest movies, TV shows, and more". Entertainment Weekly's EW.com. Retrieved 21 November 2016. ^ Miguel Helft (January 20, 2010). "YouTube takes a small step into the film rental market". The New York Times. Retrieved August 13, 2010. ^ Tsotsis, Alexia (May 9, 2011). "Google Partners With Sony Pictures, Universal And Warner Brothers For YouTube Movies". techcrunch.com. Retrieved June 5, 2011. ^ Chapman, Glenn (April 1, 2010). "YouTube redesigns website to keep viewers captivated". Sydney Morning Herald. AFP. Archived from the original on April 2, 2010. Retrieved April 1, 2010. ^ Chapman, Glenn (May 18, 2010). "YouTube serving up two billion videos daily". Sydney Morning Herald. AFP. Retrieved May 17, 2010. ^ a b Shane Richmond (May 26, 2011). "YouTube users uploading two days of video every minute". The Daily Telegraph. London. Retrieved May 26, 2011. ^ a b Oreskovic, Alexei (January 23, 2012). "YouTube hits 4 billion daily video views". Reuters. Retrieved January 23, 2012. ^ "comScore Releases May 2010 U.S. Online Video Rankings". comScore. June 24, 2010. Retrieved June 27, 2010. ^ "Hurley stepping down as YouTube chief executive". AFP. October 29, 2010. Archived from the original on August 12, 2014. Retrieved October 30, 2010. ^ Whitelaw, Ben (April 20, 2011). "Almost all YouTube views come from just 30% of films". The Daily Telegraph. London. Retrieved April 21, 2011. ^ Whitney, Lance (November 4, 2011). "Google+ now connects with YouTube, Chrome". CNET. Retrieved November 4, 2011. ^ Cashmore, Pete (October 26, 2006). "YouTube Gets New Logo, Facelift, and Trackbacks – Growing Fast!". Retrieved December 2, 2011. ^ "Eric Schmidt, Princeton Colloquium on Public & Int'l Affairs" (video). YouTube. April 18, 2009. Retrieved June 1, 2009. ^ Seabrook, John (January 16, 2012). "Streaming Dreams". The New Yorker. Retrieved January 6, 2012. ^ "Alexa Traffic Rank for YouTube (three-month average)". Alexa Internet. Retrieved September 23, 2012. ^ Nakashima, Ryan (October 29, 2011). "YouTube launching 100 new channels". USA Today. Retrieved November 29, 2013. ^ Gutelle, Sam (November 12, 2013). "YouTube Has Removed All References To Its Original Channels Initiative". Tubefilter. Retrieved November 29, 2013. ^ "Error 404 (Not Found)!". YouTube. Retrieved November 29, 2013. ^ Cicconet, Marcelo (April 7, 2013). "YouTube not just a site for entertainment, but education". Washington Square News. Retrieved November 29, 2013. ^ Humphrey, Michael (July 27, 2012). "YouTube PrimeTime: Philip DeFranco's 'People First' Plan Has SourceFed Booming". Forbes. Retrieved November 29, 2013. ^ "YouTube Partners With ABC News To Offer Its First-Ever Live Stream of the U.S. Presidential Debates". TechCrunch. Retrieved October 1, 2012. ^ Burns, Matt. "Gangnam Style Hits 1 Billion YouTube Views, The World Does Not End". TechCrunch. Retrieved 21 November 2016. ^ "YouTube Reaches 1 Billion Users Milestone". CNBC. March 21, 2013. Retrieved November 29, 2013. ^ Shields, Mike (May 28, 2013). "Arnold Schwarzenegger, Ryan Higa Win YouTube Comedy Week—Maybe". Adweek. Retrieved November 29, 2013. ^ Spangler, Todd (October 21, 2013). "YouTube Music Awards Nominees Announced". Variety. Retrieved November 29, 2013. ^ Jaworski (May 23, 2013). "YouTube has a Hollywood problem". The Daily Dot. Retrieved November 29, 2013. ^ Gutelle, Sam (May 20, 2013). "Six Reasons Why YouTube's 'Big Live Comedy Show' Didn't Work". Tubefilter. Retrieved November 29, 2013. ^ Gelt, Jessica (November 3, 2013). "YouTube Music Awards: Eminem wins Artist of the Year ... wait, what?". Los Angeles Times. Retrieved November 29, 2013. ^ Gutelle, Sam (November 4, 2013). "The YouTube Music Awards Were Weird, And That's A Problem". Tubefilter. Retrieved November 29, 2013. ^ Cohen, Joshua (November 4, 2013). "YouTube Is Now The Most Subscribed Channel On YouTube". Tubefilter. Retrieved November 29, 2013. ^ "Woman wounds 3 at YouTube headquarters in California before killing herself". www.msn.com. ^ Bindu Suresh Rai (April 2, 2012). "UAE version of YouTube launched". Emirates 247. Archived from the original on February 25, 2014. Retrieved February 14, 2014. ^ "YouTube Launches Indonesian Version" Archived July 20, 2012, at the Wayback Machine, June 15, 2012. Retrieved July 8, 2012. ^ "YouTube launches local portal in Senegal", Jubr> ^  itag 120 is for live streaming and has metadata referring to "Elemental Technologies Live".July 16, 2012. Retrieved July 25, 2012. ^ a b c d e Nick Rego (September 16, 2013). "YouTube expands monetization and partnership in GCC". tbreak Media. Archived from the original on February 6, 2014. Retrieved February 14, 2014. ^ "YouTube launches Nepal, Pakistan, Sri Lanka-specific homepages". The Himalayan Times. January 13, 2016. Retrieved January 31, 2016. ^ Tatlow, Didi Kirsten (19 July 2016). "Sorry for Having Insulted China? Here's Your Chance to Apologize". The New York Times. ^ "YouTube unblocked in China, but could Google have cooperated?". CNET. ^ "YouTube language versions". Retrieved June 2, 2015. ^ "YouTube cedes to Turkey and uses local Web domain". CNET. October 2, 2012. Retrieved October 3, 2012. ^ Barnett, Emma (September 3, 2009). "Music videos back on YouTube in multi-million pound PRS deal". The Daily Telegraph. London. Retrieved September 3, 2009. ^ Yen, Yi-Wyn (March 25, 2008). "YouTube Looks for the Money Clip". fortune.CNN.com. Retrieved March 26, 2008. ^ "Youtube bandwidth usage: 25 Petabytes per month". Willy Dobbe. July 20, 2006. ^ "YouTube: a history". Telegraph.co.uk. Retrieved 21 November 2016. ^ a b c Tapscott, Don and Williams, Anthony D. (2006). Wikinomics: How Mass Collaboration Changes Everything. New York: Penguin. ISBN 978-1-59184-138-8. ^ a b c Fuchs, Christian (2008), Internet and Society: Social Theory in the Information Age. New York: Routledge. ISBN 0415961327. 408 Pages. ^ "Analyst: YouTube Could Lose $470M This Year". Chris Albrecht, Gigaom, April 3, 2009. ^ "Maybe Google Isn't Losing Big Bucks on YouTube After All", Rob Hof, Bloomberg Businessweek, June 17, 2009. ^ "YouTube launches pay-to-watch subscription channels". BBC News. May 9, 2013. Retrieved May 11, 2013. This page was last edited on 5 April 2019, at 10:33 (UTC).